Robert Glazer is the Founder and CEO of global performance marketing agency, Acceleration Partners. Several years back, I started the simple practice of sending out a weekly Friday email to my employees. That seemingly little habit has changed my company, helped me to be a more inspirational leader, and it’s even transcended my organization and impacts tens of thousands of people around the world today. This is the story of how it all came to be. One thing I’ve learned along my journey as an entrepreneur and as a student of high-performing individuals is that the highest achievers have a morning routine. Four years ago, I didn’t. Well, at least not a very good one. It wasn’t until I read Hal Elrod’s “The Miracle Morning” that I decided to buckle down and become more intentional about how I got my day started. And I can honestly say that doing so has changed my life for the better. One of the six morning habits Hal outlined in his book is reading, specifically, positive thoughts and ideas to improve yourself—to learn from others who’ve accomplished the things you want to do. So, in addition to getting up a lot earlier than I was used to, getting my body moving, taking time for gratitude, and enjoying a quiet cup of coffee, I’d search for something impactful to read. My challenge was that most of the inspiration stories I was coming across were, well, “fluffy.” Not that there’s anything wrong with that, it just wasn’t what I was looking for. To resolve this, throughout the week, I would spend time in search of material that would inspire me, push me outside of my comfort zone, and make me reflect and question deeply held assumptions. I’d collect these stories, quotes, and ideas and focus on a few of them during my morning routine. Read our 2018 People Management Study. We surveyed 5,103 people to uncover common traits of great—and terrible—managers. As I reflected, I felt compelled to share some of these concepts and ideas with others, especially those I worked closely with. Pushing myself out of my comfort zone, I started sending an email every Friday that focused on a topic I found particularly thought-provoking to team members at my company, Acceleration Partners. Some were related to self-improvement and growth. Others shared stories that reflected our organization’s core values. And others shined the light on hypocrisies, examples of high-performance, leadership, and legacy. My goal for sending these emails was multifaceted. I hoped to get people to question status quos, self-reflect, challenge self-limiting beliefs, and realize their true potential. At my core, I’m someone who wants to be and do better and help others do the same —whether that’s accomplishing a goal, building something, or just living a more purposeful life. Sending out a weekly thought-provoking email to people within my company was a way for me to do that while also clarifying my own thoughts around important concepts. In all honestly, I thought my Friday emails would be skimmed, at best; maybe even ignored. But employees started telling me they looked forward to the messages each week and were sharing them with friends and family. The weekly emails were also having a noticeable impact within our company, as people started applying the different concepts in their work and life. Our team members began reaching new personal and professional heights simultaneously. They were running races, getting healthier, committing more quality time to family, traveling outside their comfort zones, and creating positive examples for each other. This was incredibly eye-opening for me, so much so that I decided to expand who I sent these Friday emails to. I shared my “Friday inspiration” concept at a leadership conference. Since the emails weren’t written in a way that was specific to Acceleration Partners, I offered other CEOs the option of repurposing or forwarding my emails to their own teams. Several took me up on this and began sharing my emails with their employees. They soon reported back that they were receiving the same type of positive feedback from their employees that I’d received from mine. At this point, I felt I was on to something. Today, tens of thousands of leaders in 50 countries on six continents receive Friday Forward each week. It’s also frequently forwarded within companies or posted to their intranet or Slack channels. People around the globe write to tell me how that Friday’s message resonated with them. Their feedback has added another layer of reflectiveness and gratitude to my mornings and keeps me motivated to write a meaningful Friday Forward each week. 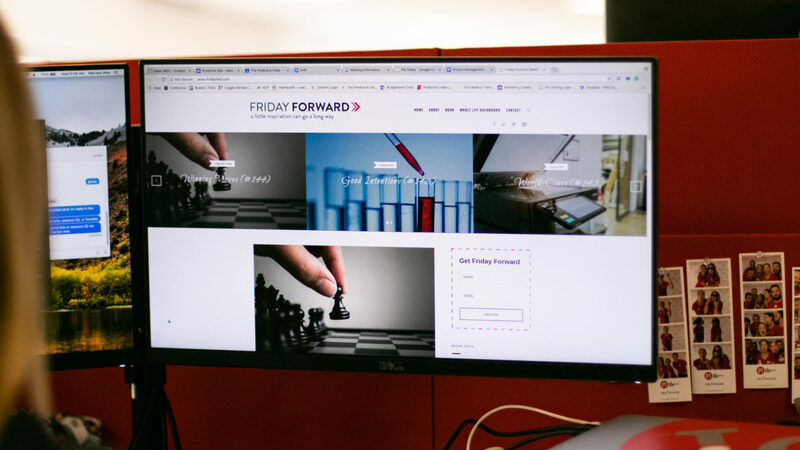 When I decided to dedicate time and energy to creating the Friday Forward emails, I had no idea what would come of it. I didn’t know if my emails would help my business in any way or even be appreciated. It honestly didn’t matter. What I’ve learned from Friday Forward and from building Acceleration Partners is that the ability to outperform—to exceed and elevate expectations—is directly related to the ability to build capacity in yourself and others. That’s what truly matters. Whether you’re looking for personal inspiration, a new perspective, or a resource to help get your team to be more self-aware, resilient, and accountable, consider sharing or starting your own Friday Forward. And if you decide to do what thousands of others have done and forward it to someone, I’d love to hear why and how the message resonated with you. Robert Glazer is the Founder and CEO of global performance marketing agency, Acceleration Partners. Under his leadership, Acceleration Partners has received numerous company culture awards, including #4 on Glassdoor’s Employees’ Choice Awards, Ad Age’s Best Place to Work, Entrepreneur’s Top Company Culture, and Inc. Magazine’s Best Place to Work. He recently authored the international bestselling book, “Performance Partnerships” and is a sought-after speaker by companies and organizations around the world. You can subscribe to Bob’s inspirational Friday Forward e-mail, received by over 40,000 people each week, at www.fridayfwd.com.